Spain classified easily for the finals, topping their qualifying group with six wins and two draws, and were one of the eight seeded teams, being drawn in Group B together with Slovenia, Paraguay and South Africa. Camacho's side won through the group stage with maximum points, and beat Ireland to reach the quarter finals. However they were eliminated on penalties by co-hosts South Korea after some controversial refereeing decisions. 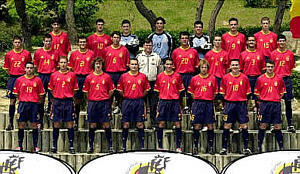 © All rights reserved 1999-2009 SOCCER-SPAIN, S.L.